The default language is the language that end-users see in your Help Center by default. The Help Center default language is initially set to English, but you can change the default language. You can set a default language for Help Center that's different than the default language for the agent interface in Zendesk Support. You must be a Guide manager to set the default language for Help Center. The Help Center default language is initially set to English. You can change the default language. You can choose from all of the Guide supported languages and most of the languages that are available by request, some of which have crowd-sourced translations. If you choose a supported language, text that appears in Help Center by default (for example, "search" and "comments") will appear in that language. If you choose a language that is not supported, default text will appear in that language only if there are crowd-sourced translations. If you have enabled multiple languages for your Help Center, you can change the default language to any of the languages you have enabled (see the next section). 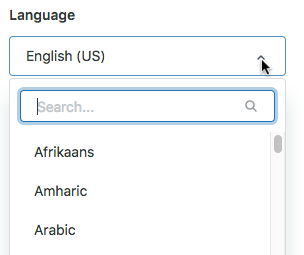 Click the Language drop-down, then select a language. You can scroll or search the list. You can choose from all of the Guide supported languages and most of the languages that are available by request, some of which have crowd-sourced translations. If you have Guide Professional or Enterprise and Support Professional or Enterprise, and you've configured multiple languages for your Help Center, you can change your Help Center default language to any of the languages you've enabled. Click the options menu beside the language you want to set as default, then select Set as default. Help center is geolocation ready? I want my english users to get automatically redirected to their language when the browser language is detected as english or their IP location. Currently, my default language is spanish, but I don't want english users to switch to their language manually. If you've localized your content and set up the supported languages on your account then the users should be directed to the appropriate content baed on the language detected in their browser. Can we redirect some articles to the English version if their other language variants are not yet ready? Meaning, I want to publish an article and all the Help Center languages should be seeing the English version, then the actual language version once we translate them after a week or so.